So the last couple of days I've been a little busy with the Kentucky Derby going on here in Louisville. We had great weather for the Kentucky Oaks but rain on Derby day. It ended up being okay though, we were able to stay dry and undercover for the majority of the day and the sun even tried to come out just in time for My Old Kentucky Home. I hit the exacta on the Derby race too -- hopefully Super Saver has another great run in the Preakness in a couple of weeks. 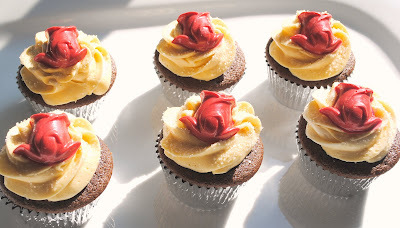 Since the Kentucky Derby is the Run for the Roses, I decided to use roses to decorate these cupcakes. 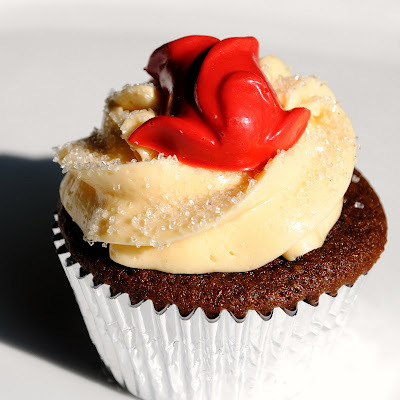 I used a candy mold to make small chocolate roses out of red candy melts. All you need is a little mold, melt the chocolate, making sure to stir frequently and microwave in short intervals and then transfer it to a small squeeze bottle and fill the candy molds. Once they are set, they pop right out and can be stored in an airtight container. 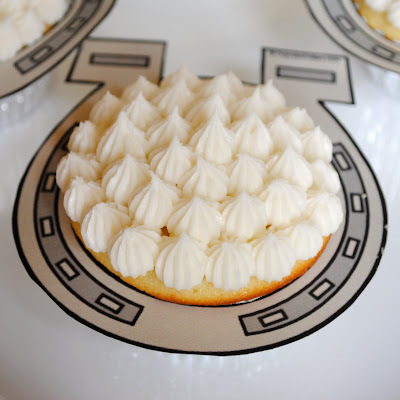 For the horseshoe cupcakes, I used cupcake collars - I found these online and thought I would try them out. I'm not really sure about them yet, so I would love to hear what you think. 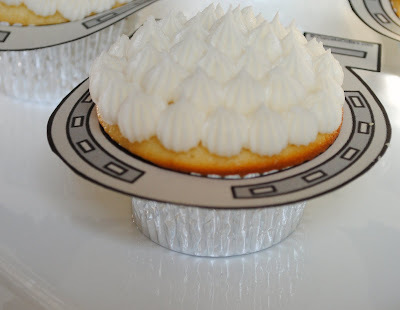 Basically you print them out on your computer, cut out the shapes and the centers and then just slip them over the cupcake liner. They can be taped on the bottom if necessary but I didn't need to tape mine, they fit pretty snugly. For the rose cupcakes, I used this Devil's Food Chocolate Cake and for the horseshoe cupcakes, I used a classic yellow cake recipe from Martha Stewart. I frosted both with a cream cheese icing. Preheat oven to 350 degrees. Line a 12 cup muffin pan with paper liners. Sift together the flours, baking soda, baking powder and salt in a small bowl and set aside. In a mixing bowl, cream butter and sugar on medium high speed until light and fluffy, about 3 minutes. Add eggs, 1 at a time, mixing well after each addition. Add flour in 3 parts, alternating with buttermilk, beginning and ending with the flour mixture. Beat after each addition until just incorporated. Add vanilla and beat until combined. Use a cookie scoop or ice cream scoop to portion the batter evenly into the muffin tins. Fill each about 3/4 of the way full. Bake 18-20 minutes, rotating pan halfway through, until the tops are golden and spring back when touched. Cool about 5 minutes in the pan and then transfer to a wire rack to cool completely. When completely cool, frost as desired. Beat together cream cheese and butter on medium high speed until smooth, about 3 minutes. Beat in vanilla. Add powdered sugar, 1 cup at a time, until incorporated. Add heavy cream and additional powdered sugar as necessary to reach the right consistency. Add gel food coloring if desired. 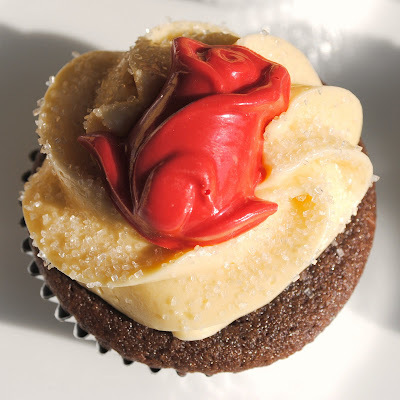 Transfer to a piping bag and pipe onto cupcakes as desired. Looks amazing as always! I thought about you yesterday with all of the rain--congrats on the exacta! very pretty I like the roses!